Jen, Jen, Jen… I have been on this journey with her for quite some time now, as she joined with-in the first 6 months of me opening Edge Body. In a world where people are on the qwest for “fast results” or the next “quick fix” for their health and /or weight issues, Jen was different. She was looking for a place that would instill long term habits and really, just find a place for her. A place where she could get some time for herself and receive the support she needed towards changing her health and life. She knew that she wanted to overhaul her exercise routine first and get “working-out” to be apart of her daily routine. So for her first year, that’s what she did. Always showing up to 4:30pm class and on Saturday mornings to build the habit. In the process, she also built some strength, lost some weight and formed some lasting friendships. Then in January 2017, she was ready to take the next step and buckle down on nutrition. That’s when she started individual nutrition coaching. Like any other coaching, a coach can give you tips and guidance, but it’s up to the person to put in the work and put those coaching tips into action. I’m beyond proud of this health care provider, mother, wife and friend. When you do things the healthy way, the physical and emotional transformation far exceeds the number of pounds lost on the scale. Jen lost 10 pounds duirng her nutrition coaching and was down another 5 the month after. BUT, I’ll let her take it from here. Watch the above video for her story straight from her. Never stop working towards your goals, Jen!!! You have been awesome to coach! Here she is pictured on the left in one of her first classes at Edge (summer 2015), center in Jan. 2016 @ 201lbs. and on the right in April 2017 @ 177.4lbs. 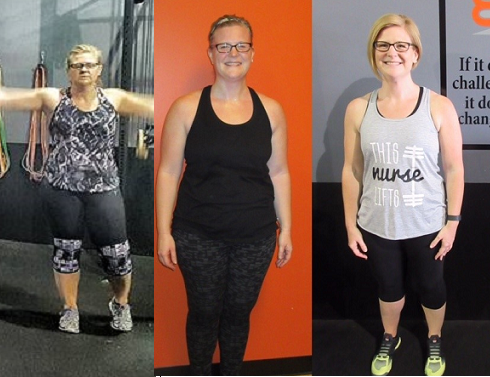 During her 12-week nutrition coaching just this year, she lost 2.1% body fat and lost 2.5 inches from her waist, 3.25 inches from her hips and another 1.5 inches from her thighs!